Daydreams of Quilts: One Lovely Blog Award! I am thrilled to have been awarded the One Lovely Blog award by Lori at SewPsyched! She awarded it to me a month ago and I just pulled my head up from my fabric stash and realized that! She is one of my best online friends and I really enjoy her blog so please check it out. You will learn so many cool things from her! Okay, so now I'm supposed to tell you 7 things about myself. Oh, la, la! This is always a challenge to me. I think I might get personal here so I hope that's okay with you. I wanted to put a photo of my husband in uniform here but he wouldn't grant permission. So here is one of my favorite makes. This was made for the IG Mini Quilt Swap last year and mailed to Texas. I called it "Gasoline Rainbow." 2. I'm sure you all know this about me but I love quilting. Other than my three children, who I love more than anything, quilting is my reason for living. 3. I'm Canadian (as you can tell by the above quilt) and a prairie girl. I have lived in Alberta for most of my life except for four years in Vancouver BC (British Columbia) as a child and four years in Oromocto NB (New Brunswick) in my early 30s. 5. It took me until I was 40 to realize that I have some great ideas to share and to have the confidence to start writing patterns and submitting ideas to quilting magazines. I wish now that I had this confidence ten years ago. It's the perfect use for my Journalism Arts diploma don't you think? If only I had know when I was at SAIT (Southern Alberta Institute of Technology) at age 18 and 19 that I was destined to become a quilter and would want to write about little else. 7. My maternity leave will be up next week. I will not be returning to work outside the home so will be concentrating in earnest on writing fun patterns and hopefully publishing a book. I really appreciate everyone who reads my blog, follows me on Instagram, follows me on Facebook, writes me lovely kind encouraging comments and buys my patterns. So many people that I know personally just glaze over when I start talking about quilting and couldn't care less. (Which to me means they couldn't care less about me.) I truly appreciate all of you in the quilting community who interact with me and care about what I'm doing. I recently rolled over 2000 followers on Instagram and I'm having a giveaway. Write me a comment on my giveaway post over there to enter to win some Cotton + Steel from me. :) Winner is @_glass_half_full! It was Canada Day yesterday. This little doggy is no longer with us. He's been gone to doggy heaven for a year now but wasn't he cute one year in his bandana? 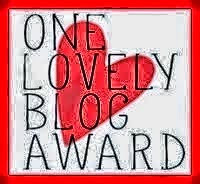 So now I would like to nominate the the following blogs for the "One Lovely Blog Award." Please stop by their blogs and check them out.